This lovely person's name is Rochelli Rodriguez and she is a freshman here at South Broward. She loves the writing and photography aspects of journalism and signed up because it interested her, not really expecting anything too special out of it. Her passion is for writing fictional stories and tales and her strong suit is the sciences. Rochelli, like most high school students, isn't the best at mathematics but it doesn't hold her back too much. She doesn't really check out news media but likes to check out Instagram from time to time. When not at school working hard, Rochelli is either reading up on her favorite books or taking care of her family. She isn't very sporty but is in a whopping 5 clubs total. Her greatest fear is of clowns and she hopes to have a good and successful life. 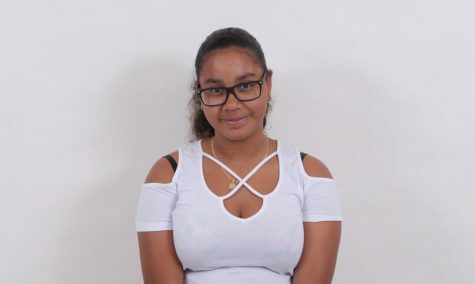 With her love for reading and writing, it's no surprise that she wants to become an author later in life, but mostly wishes to go with the flow and see where life takes her. Something she wouldn't be caught dead in? A bikini. Her music taste varies and anything with a good beat is good for her, even country.